In both traditional and contemporary worship contexts (and everything in between), musical underscoring is a great way to elevate spoken texts, connect musical elements that are split up by a reading or prayer, or highlight a drama or prayer in the service. 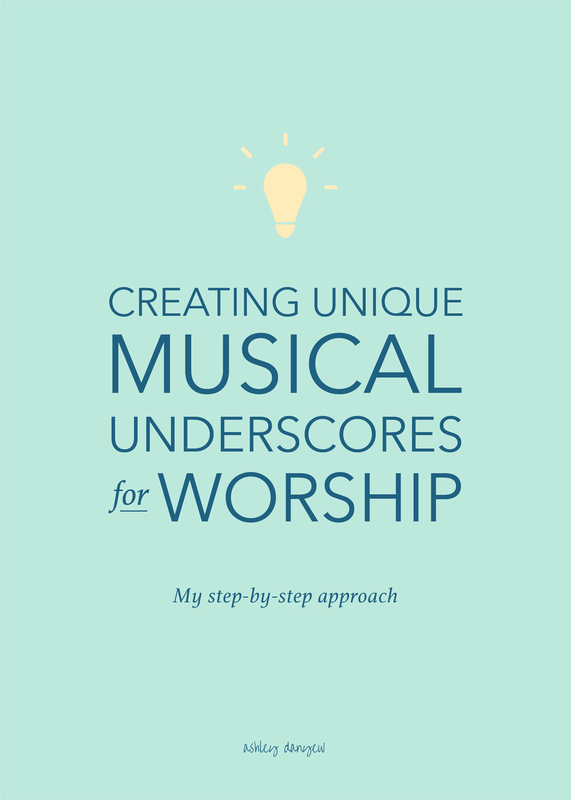 Today, I’m sharing my simple step-by-step approach to creating unique musical underscores for worship. Before we dive into all that, let’s talk about a few ways you can use musical underscores in your worship services. Congregational readings - consider playing softly as the congregation reads the Call to Worship, a litany, a creed, or other spoken liturgy in the service. This works particularly well if the spoken element leads into a sung response of some kind. Use your underscore to help prepare the congregation for what they’re about to sing by establishing tonality, meter, and perhaps even the underlying chord progression. Prayers - underscore a prayer with soft, simple chords, punctuating the natural pauses and breaths of whoever is praying. Mirror the tone of the prayer with the activity in your playing and subtle dynamic changes. Be prepared to cadence quickly when the prayer is finished, or pivot into a song, hymn, or musical response, if one follows. Scripture readings - this works especially well for well-known, story-like passages such as the Luke 2 reading we do on Christmas Eve or the account of the resurrection that we read on Easter Sunday. Dramas - use a musical underscore to heighten a spoken (or silent) drama. Think of this like movie music - setting the tone, building to a climax, adding suspense, heightening emotions, etc. Spoken introductions - use underscoring to connect two worship songs as the worship leader gives a brief welcome or introduction to the next song. Before you jump right into music, it’s important to spend some time with the text you’re going to be underscoring. Are there particular words or phrases you can highlight musically? How long is the text (i.e. how much time do you have to develop musical ideas)? Practice reading it out loud to get a sense of timing and overall length. 2. Choose a key and meter. Choose a key and meter for your underscore. A key like C major is bright and joyful; while a key like A-flat major is much more subdued and gentle. Consider, also, the context of this underscore in the worship service: Is it coming right after another piece of music? Or, does it lead into a sung response of some kind? If so, that may help you choose a key and meter. Play around with a simple 4-chord progression like I-vi-IV-V - something you can repeat and vary easily. Try open fifths in your left hand and a few simple, repeated melodic ideas in your right hand (something with a 5-note range). 3. Spend some time improvising and coming up with musical ideas. Remember, keep it simple! This isn’t a solo moment in the service; instead you’re supporting and adding to something else, most likely something with text that needs to be heard and comprehended. Make sure your music isn’t too busy or distracting, that it doesn’t take away from whatever else is happening. Keep it very soft and slow. Repetition is a good thing! Once you have a musical idea you like, play it again (several times in a row). Then, vary it a little, change the rhythm a bit or change melodic direction and repeat that idea several times. Consider using lots of long, sustained notes - you might even try playing a single note in the melody over a slow-changing bass line. Use the audio recorder on your phone or another device and record yourself reading through the reading you’ll be underscoring. This is so helpful with timing and listening and will be a really valuable tool in your practicing. Play your recording back and practice playing different versions of your underscore. Listen, adjust, and tweak, as needed. 5. Jot down any notes. Write in chord symbols, melodic ideas (finger numbers, note names, whatever), rhythmic ideas and variations, etc. on a hard copy of the reading, so you can follow along in the moment. I find this helpful, rather than notating the full underscore and trying to steal a glance at the reading off to the side. If you’re not totally comfortable reading chord symbols, this is a great opportunity to get your feet wet and start developing those skills! Challenge yourself to step outside your comfort zone (in your practicing, at least - that’s the best place to start). My best advice: Feel free to experiment and try new things. Underscores come in a variety of styles, often influenced by whatever it is you’re underscoring. If you’re used to using an acoustic piano, try using a keyboard or clavinova instead. Experiment with different sound settings - strings or vibraphone, or something else. Recruit a few handbell players to ring simple open chords (long and sustained), perhaps building to a random ring and final chord by the end. Try the singing bell technique for something more subdued and magical. Score this out in advance so players know when to change bells and when to begin ringing more rapidly. Try it on the organ for a more traditional approach. Use soft, sustained string or flute stops, with shades closed. Have you ever used underscores in worship? What is your process like?